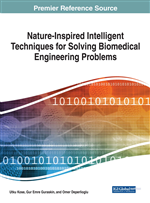 Artificial immune systems inspired by the natural immune system are used in problems such as classification, optimization, anomaly detection, and error detection. In these problems, clonal selection algorithm, artificial immune network algorithm, and negative selection algorithm are generally used. This chapter aims to solve the problem of correct identification and classification of patients using negative selection (NS) and variable detector negative selection (V-DET NS) algorithms. The authors examine the performance of NSA and V-DET NSA algorithms using three sets of medical data sets from Parkinson, carotid artery doppler, and epilepsy patients. According to the obtained results, NSA achieved 92.45%, 91.46%, and 92.21% detection accuracy and 92.46%, 93.40%, and 90.57% classification accuracy. V-DET NSA achieved 94.34%, 94.52%, and 91.51% classification accuracy and 94.23%, 94.40%, and 89.29% detection accuracy. As can be seen from these values, V-Det NSA yielded a better result. Artificial immune system emerges as an effective and promising system in terms of problem-solving performance. The artificial immune system is modeled considering the human immune system. Tissues and organs related to immune system in organism are thymus gland, bone marrow, lymph nodes, spleen and tonsils. There is no central organ in the immune system to coordinate the work of related tissues, organs, molecules and cells. The immune system recognizes foreign cells entering their body with their special cells and neutralizes them. The lymphocytes that are the basic immune cells are divided into two classes, the “T” and the “B” cells. While the “B” cells can recognize the antigens free in solution, the “T” cells need the antigens to be made known by other helper cells. The natural immune system simply works like this: When a foreign molecule enters the body, special molecules (macrophages) wrap around this foreign molecule, allowing the other immune cells to see it. Helper “T” cells stimulate white blood cells when they see the specific molecules, and these cells multiply. The “B” cells begin to produce chemical substances called antibodies, and the antibodies combine with the antigen making it easier to destroy the antigen. The destructive “T” cells stimulated by the helper “T” cells enable the antigen to be destroyed. Natural immune system cells must be able to distinguish between their own cells and foreign cells and molecules (antigens) in order to perform the activities described above. The body's own cells are called “self” and the foreign cells are called “nonself”. When “nonself” cells are destroyed, “self” cells are not damaged (de Castro & Timmis, 2002). Inspired by the natural immune system, the generated artificial immune systems are used to achieve resolution in different types of problems. These are classification, pattern recognition, optimization, anomaly detection, computer and network security, error detection, time series analysis. Clonal Selection Algorithm (CSA), Artificial Immune Network Algorithm (AINET) and Negative Selection Algorithm (NSA) are generally used in these problems. The clonal selection algorithm is particularly used in multipurpose optimization and classification problems and the negative selection algorithm is used in anomaly detection, error checking, computer and network security problems. Forrest et al. (1994) investigated a computer security system based on the separation of “self” and “nonself” using an r-consecutive bit rule and a negative selection algorithm. The system operates according to the logic of the negative selection algorithm. A set of sensors is first created, and then the protected data is monitored by comparing with the generated sensors. If the number of common consecutive bits in two arrays is greater than or equal to a number r, then a match can be mentioned. The study also provided formulas to estimate the likelihood of a match between two random sequences and the likelihood of change-detection for different configurations of the system. According to the results obtained, as the number of arrays to be protected increases, the size of the sensors used does not need to increase. The probability of detection increases exponentially with the number of independent detection algorithms. The cost of creating a sensor increases exponentially with the size of the “self” set. In artificial immune systems, a basic type of sensor that includes all the useful features of the immune system has been described. Detectors are represented by bit-sequences in a binary Hamming shape-space. The detection event is accomplished by the matching process of the r-consecutive bits between the two sequences. It is the responsibility of the learning part of the system to mature lean sensors into memory sensors with negative selection. The established artificial immune system overlaps most important features of a classifier system. The recommended YBS detected all of the eight abnormal occurrences in a network system made up of 50 computers each of which has 100 sensors. While some systems in this area are giving millions of false alarms in a month, the proposed system gave two false alarms on average in a day.